It's no secret that Michael Jackson had a thing for video games. His Neverland Ranch arcade collection highlighted his penchant for spending big, but maintaining a respectable level of quality. 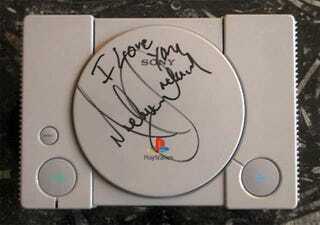 Oh, and he signed a PlayStation once. That Michael Jackson signed PlayStation is now for sale, seemingly authentic in its scrawling upon by the late King of Pop. While the starting bid is not ludicrous, the Buy It Now price on eBay certainly is. The seller is willing to part with it right now for $1.5 million. It's doubly special, according to the seller, being the 1,000,001st PlayStation to roll off the assembly line. Funny, that somehow sounds a little less believable than the Moonwalker actually scribbling "I Love You, Michael Jackson" on a game console.